Andong is a city located in Gyeongsangbuk Province, South Korea. Once a home to many Confucian scholars, it was historically known as the capital of academia and intellectual culture of Korea. It is also often associated with folk traditions, particularly the well-known Andong mask dances. 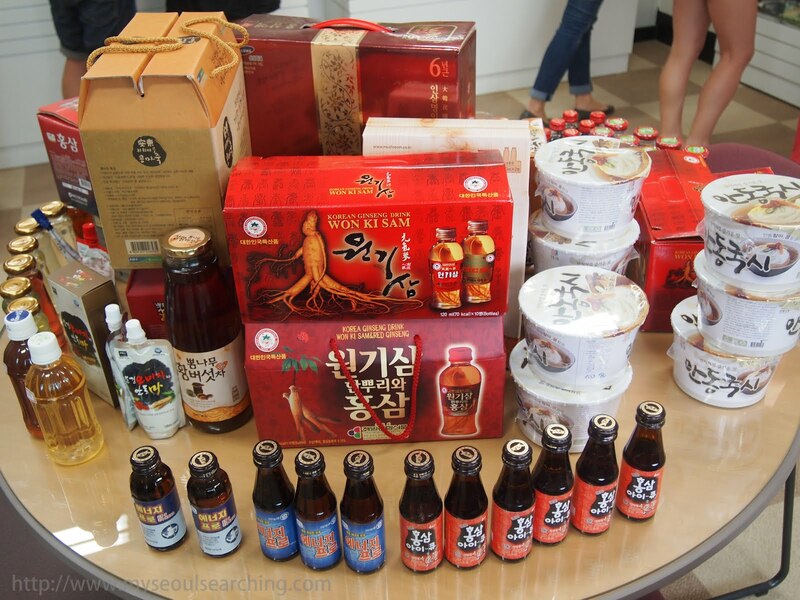 What many do not realize, however, is that Andong is famous for its cuisine and traditional alcohol. I had been planning to get to Andong for the past two years, but due to various circumstances, my plans always fell through. So, you can imagine my excitement when I was given the chance this past weekend to travel there on a culinary tour- a first for me- with O'ngo Food Communications, the leader of food tours and cooking classes in Korea. The tour was also sponsored by MBC, who filmed the entirety of the journey for an upcoming documentary on the cuisine of Andong, and Big Farm, a company that aims to bridge the gap between urban and rural areas in Korea. Our day started bright and early in Itaewon, where we boarded our stylish bus and began the three and a half hour drive to Andong. We had a few guides from O'ngo and Big Farm who made sure that we were comfortable and educated throughout the trip. They were extremely informative and thanks to them, I not only ate well in Andong, but I learned a lot, too. After an extended nap, during which the camera crew no doubt obtained a generous amount of footage of me drooling or snoring or both, I woke up just in time to see the beautiful rolling hills of Gyeongsangbuk-do. It was obvious we were in farming country and it wasn't much longer before we arrived at our first stop: the Andong rest station. A rest stop on a food tour, you ask? It seemed odd to me, too, but I have to say that I was impressed with the facilities. 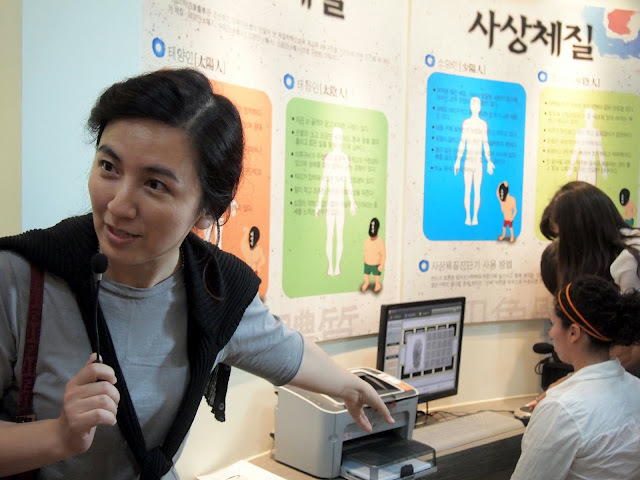 Just earlier this year, Andong constructed a small museum/"medical cafeteria" at the location to inform travelers of the city's culture. We checked out some of the items on sale, which ranged from silks to traditional paper items. Each of the items was beautifully crafted by artists from Andong. We were also able to sample some traditional teas, including a spicy pepper tea. The next stop was the Gyeongsangbuk-do Medical Crop Cluster Center, the headquarters of all things related to Korean medical herbs. Andong, with its ideal geography and climate for agriculture, produces the majority of the medicinal crops of the country. We learned a bit more about the health benefits of various crops and how some of them are incorporated into various foods and dishes, like samgyetang (ginseng soup). 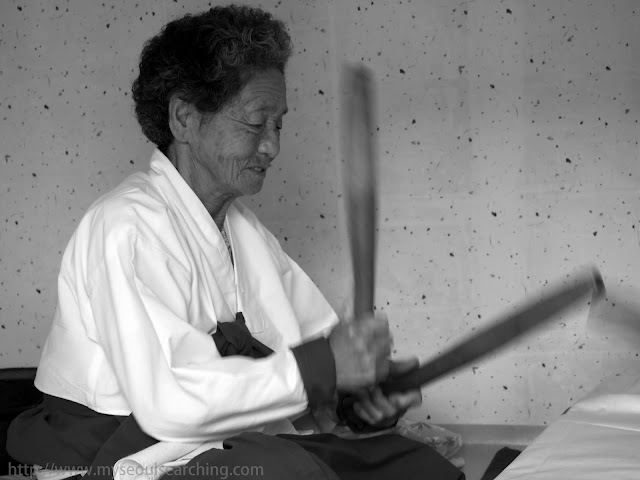 We were also introduced to ma, a medicinal root used for stamina (what isn't in Korea?) and weight loss (the root is apparently a component of idol group Girl Generation's diet). We would be hearing about this root a lot more throughout the day. 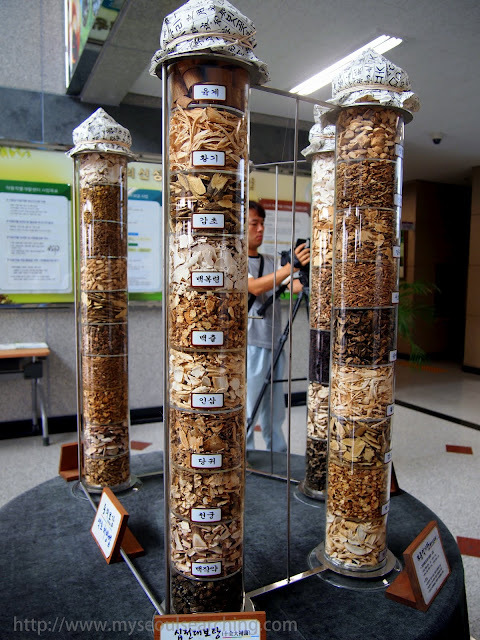 Medicinal herbs and roots on display at the Gyeongsangbuk-do Medical Crop Cluster Center. Jia of O'ngo talks about body types in oriental medicine. Products using medicinal herbs and roots were on display at the crop cluster center. After being greeted by a gentleman dressed in yangban (noble class) clothing, we were served lunch at a beautiful wooden hanok (traditional house) at the Hahoe Hanok Village. Our meal was a nice spread of heotjesabap, which, when translated, means "fake jesa food." Jesa are Confucian ceremonies held to honor one's ancestors on their deaths or during special holidays like Chuseok. 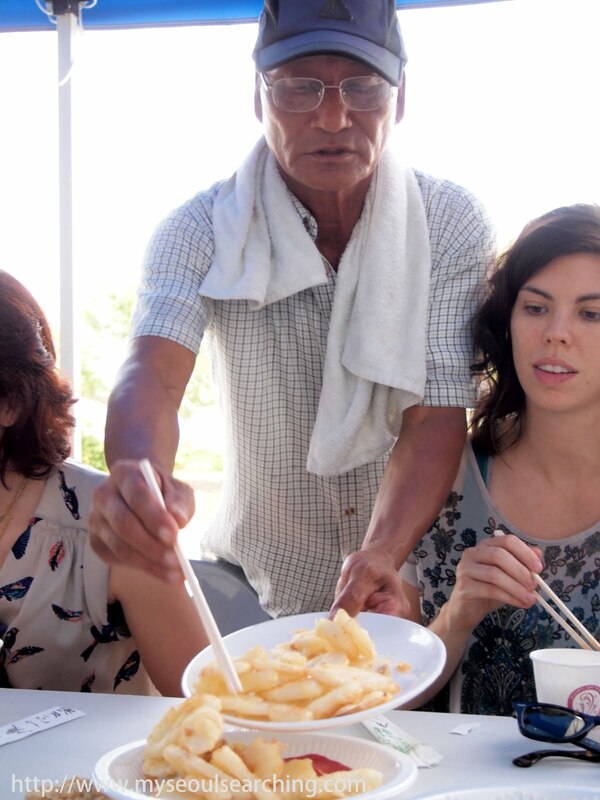 During these ceremonies, special foods are prepared which are to only be consumed by the ghosts of the ancestors. It is common knowledge in Korea that ghosts do not like strong flavors, so these ceremonial dishes are prepared without garlic or spices. As such, heotjesabap consists of a bibimbap like dish of rice and vegetables that is prepared without spicy condiments and instead uses soy sauce for flavoring. 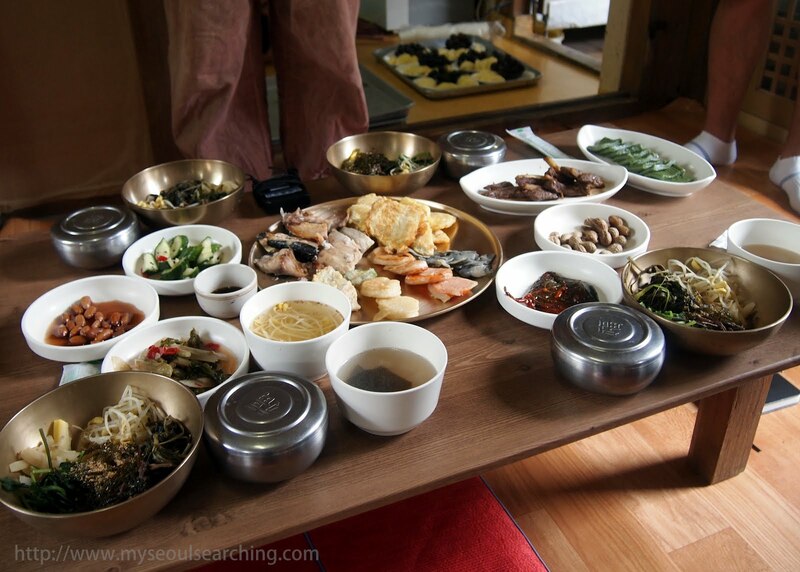 Our heotjesabap was also served with jeon (Korean pancakes), fish, mugwort rice cakes, soup, fruit, and a variety of vegetable banchan (side dishes.) Although I usually prefer my food with a kick (extra gochujang, please), the meal was delicious. The ingredients were fresh and though the flavors were a bit on the bland side, they worked nicely together. The atmosphere was perfect and it was obvious that everyone on the tour enjoyed their meals. Heotjesabap is not only tasty and traditional, but beautiful, too. Hahoe Hanok Village is set up to represent a traditional Korean village and though it is a tourist destination, it is also home a large number of families that reside within its walls. The homes vary in type with some being the wooden, tile-roofed houses that belonged to the upper classes, while others are models of lower-class residences, with straw roofs. There were a number of totem poles throughout the area with carved faces that resembled the masks that Andong is so famous for. Laundry hung on lines. 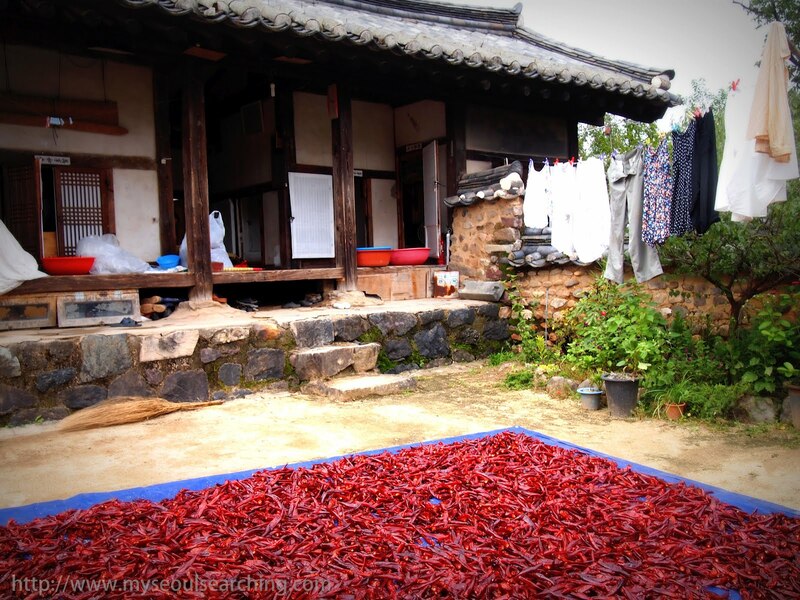 Chilli peppers were laid out to dry in the sun. Two grandmothers ironed clothes by beating them with sticks. It was easy to get a sense of what Korean village life was once like at the Hanok Village, but I have to admit that the segway rental center kind of ruined it for me. 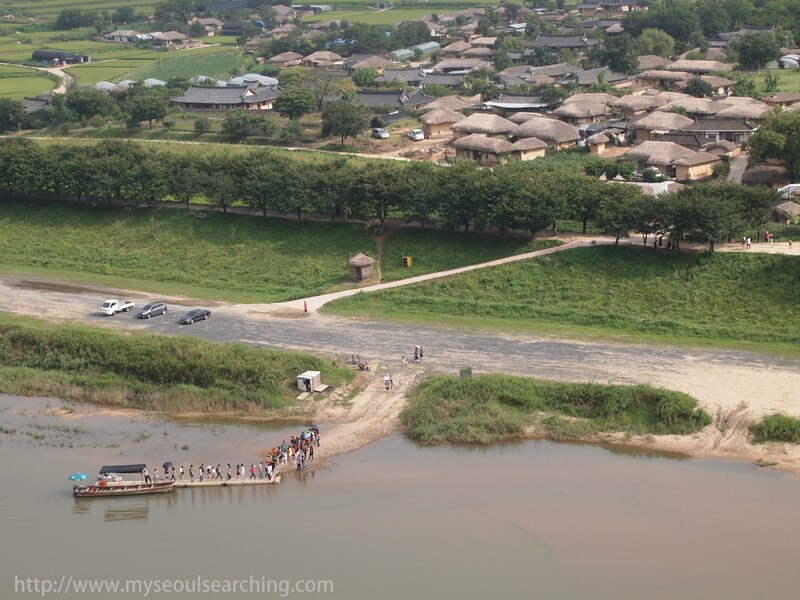 Segways... in a traditional Korean village? Really? 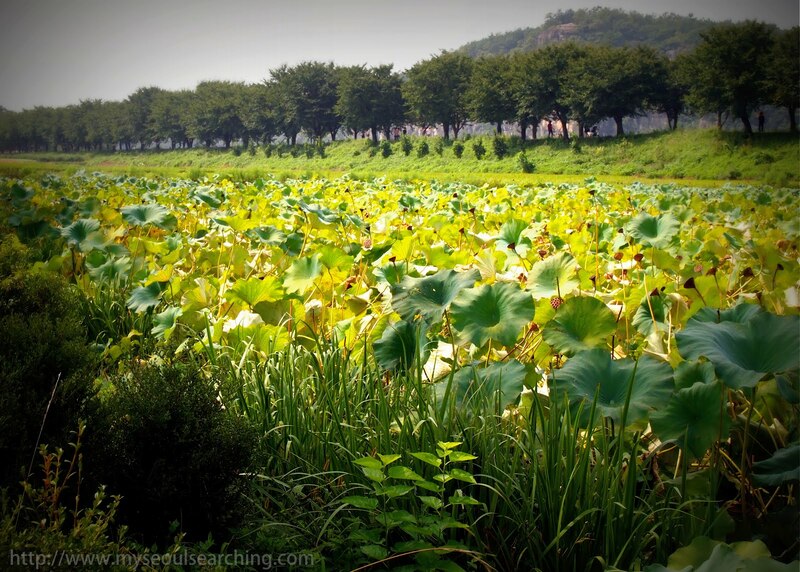 Lotus plants at the Hahoe Hanok Village. Many families still reside in the hanoks at Hahoe Village and enjoy the slow pace of life within its walls. Ironing... the old fashioned way. The village is situated along the Nakdong River and visitors can take a small ferry boat to a hiking path nearby, which is just what we did. The path led us through lush greenery to another hanok, then further on to Buyongdae Cliff that overlooked the entire village. It was the perfect time of day to catch an impressive glimpse of the traditional homes and the hazy mountains that sat in the background. As content as we all were, the day was still not over. Boarding the ferry to Buyongdae Cliff. The view of Hahoe Village from the cliff was well worth the hike. Our final stop was Buyongdae Farm, the biggest producer of Andong ma roots. 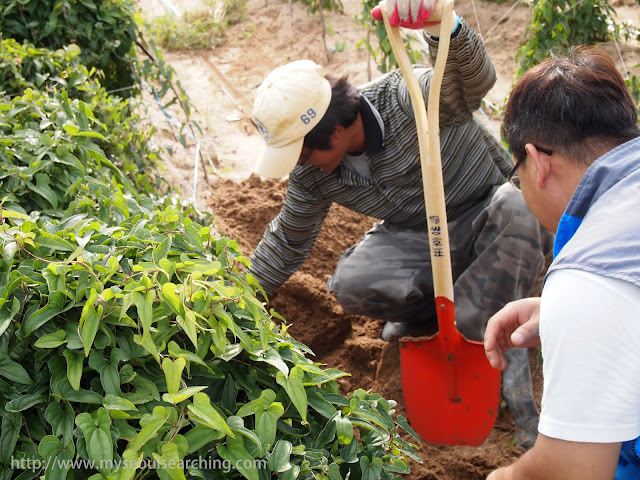 We were led to a patch of land where some of the farmers were harvesting the crop. The first thing I noticed was that a few of the farmers were quite young, probably in their twenties. 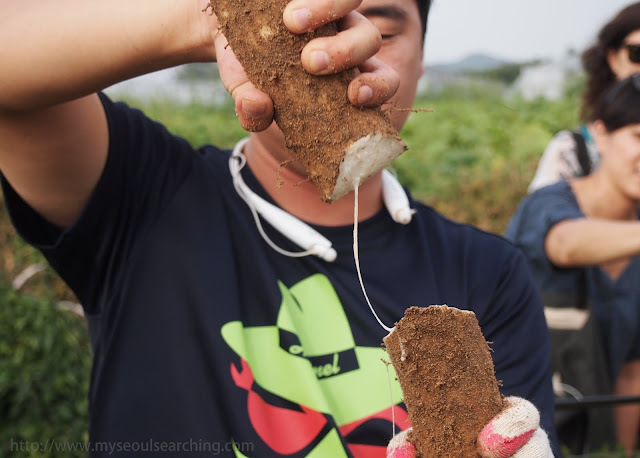 It was refreshing to see this, as many younger Koreans are flocking to the big cities to pursue 'bigger and better' dreams, threatening the future of farming as the country knows it. We watched as the farmers pulled up some of the first ma of the year, as it is usually harvested in November. The root was then cut open to reveal the slimy white goo that is used as medicine. Farmers demonstrate how to pull up the root. The medicinal goop used for stamina and stomach ailments. We headed back to the farm where women were cooking up a variety of foods for us to try, each containing ma as an ingredient. We first tried raw ma and were not exactly impressed with its complete lack of flavor and gooey coating. The deep fried ma chunks were a bit better, like anything that is deep fried. 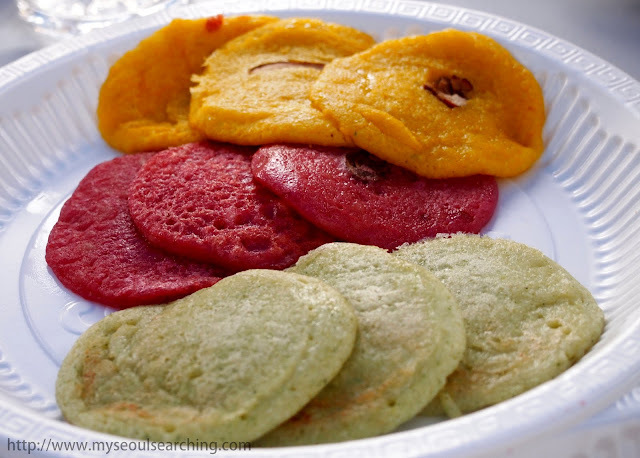 The pancakes that followed were a hit and saved the root vegetable from completely striking out, as did the ma makgeolli (rice wine). Even though I'm a country girl from the southern state of Mississippi, it was actually my first time on a farm and I was loving it. There is something really special about being so close to the food source and the people that put their hearts and souls into making it grow. As far as gastronomy is concerned, nothing really can compare with that. Pumpkin, beet, and broccoli pancakes made with ma. One of the farmers serves us generous portions of deep fried ma. The kind folks at Buyongdae Farm enthusiasticly waved goodbye as our bus pulled out onto the street and headed back toward Seoul. In a few hours, we were once again in the middle of concrete and neon but our bellies were full of delicious Andong specialties and our faces were lit up with a rejuvenation that can only be inspired by the Korean countryside. I’m a food lover and I never visited this place before but your information is forcing me to visit there. I must want to visit this place in future. These days, I’m traveling to us west coast bus tours. Hope I approach the similar place of Hahoe Hanok Village over there to enjoy food.